Pulmonary infections have always been a cause of high morbidity and mortality, particularly in the pediatric and geriatric population and in immunocompromised hosts . Pulmonary infections have various etiologies and have variegated patterns on radiographs and computed tomography (CT). 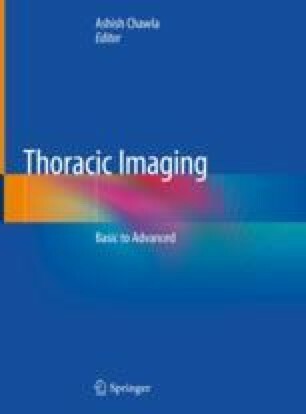 Imaging plays an important role in the initial diagnosis and follow-up of various lung infections. Radiographs can be normal or non-specific during the initial evaluation, and CT findings may be more definitive. CT not only helps with the diagnosis but can also aid in management by guiding the diagnostic and therapeutic procedure. The pulmonary infections spread by direct or indirect contact with the infected host, droplet transmission, or an airborne spread. In rare cases, some infections can also be transmitted by vectors, namely, insect or animal hosts, and rarely by direct invasion from nearby infected organs. Pulmonary infections may have typical imaging patterns and distribution based on the mode of spread. There are a number of well-described imaging patterns of alveolar infections. The localization and morphological features on imaging may help in the diagnosis of infection and identification of mode of infection and, in certain cases, the microorganism responsible for the infection.